This card is made from one of my favorite Stamps. I love each image on the Winter Bird Stamp set. This bird reminds me of a red Cardinal which is Indiana's State Bird. It was stamped with Closed to My Heart Ink and then cut out with Spell Binders Large Circle die. The matting and embossing was done using the Large Scallop die. Doesn't the Cuttlebug Snow Flake Embossing Folder make for a nice background. I used SU Ribbon slot punch to run the ribbon through and the bow was added on top of the ribbon. My JOY words were cut with the Cricut. I just received my order for these little Christmas Poinsettia's which are a suede like material and I think they are adorable. They arrived just in time as it was just what I needed to finish this card. A beautiful card Joan, I can't wait to get time to play with my set! 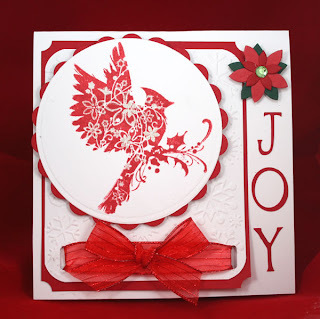 The red and white is beautiful -- this is one stamp from the set I have not used yet, and red IS the color for it - just gorgeous!! !